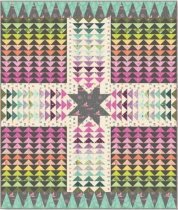 We love all of Tula Pink's fabrics from Free Spirit. This quilt is made from her Spirit Animal line that came out last fall. 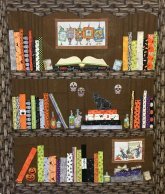 It includes 23 prints and 2 solids (over 11 yards of fabric) and the binding is included. What a stunning quilt! You can find it on our web store. Speaking of Free Spirit Fabrics, you may have heard that they have been sold. They have have been bought by the Jaftex Corp. Henry Glass, Blank Fabrics, and Studio E are all fabric lines under the Jaftex Corp umbrella. All of Free Spirit's designers Tula Pink, Anna Marie Horner, and the Kaffe Fassett Collective, plus others,will continue on with them! I know this makes us very happy. The good news is that the new Kaffe we just ordered and is due to come in April will not be affected by the sale and should be shipped as planned! We are continuing with our Midnight Clear quilt. We are nearly to the end so watch for a new BOM starting in April or May! Several gals with embroidery machines wanted to get together for 3 days of sharing and embroidering. If you have a machine and would like to join in you are welcome to. They plan on leaving the machines set up for the 3 days. If machine embroidery is something you have been thinking about doing, come check out what all the fun is about! We are moving Sharon's class up by a week because of retreats. She is working on this beautiful Disappearing 9-Patch. This is great for beginners or if you need a quick quilt for a special event or if you just want to get out of your house and sew with friends! 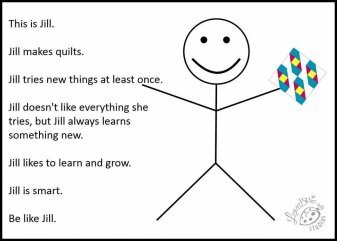 Celebrate National Quilting Month by trying something new!